Pregnant reviewers put Crampeze to the ultimate test! Leg cramps are one of those weird pregnancy symptoms that you probably won’t know anything about, until you’re writhing in pain in your bed, just when you were finally resting your weary body. They’re a fairly common symptom, with about 30 per cent of pregnant women experiencing leg cramps, and there is something you can do to help ease the pain. More than 60 per cent of our testers gave Crampeze a glowing endorsement for relieving their leg cramp symptoms, scoring them either four or five out of five. More than three quarters of our reviewers found relief from their pregnancy leg cramp symptoms after taking Crampeze for four days. In the ultimate tick of approval, an overwhelming 80 per cent of our pregnant testers said they would recommend Crampeze Pregnancy Leg Cramps chewable tablets to family and friends suffering from pregnancy leg cramps. Loved the taste, hubby kept trying to steal them and eat them as lollies! I can’t really stomach much at the moment so for me to keep it down is a bonus. Thank you to our wonderful reviewers, and we’re thrilled that the majority of you now have relief from those awful pregnancy leg cramps! 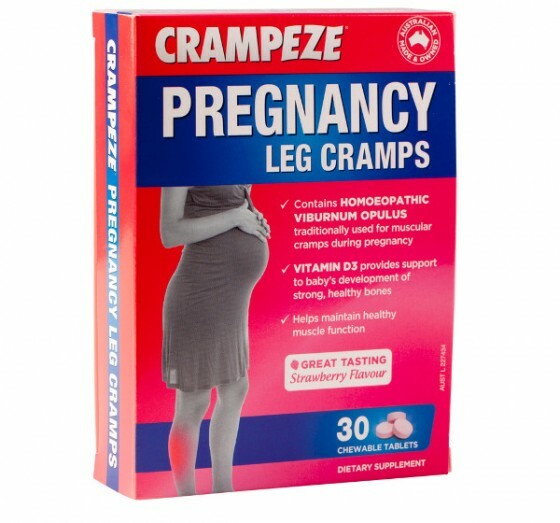 Crampeze Pregnancy Leg Cramps are available from Coles, Chemist Warehouse and pharmacies across Australia.